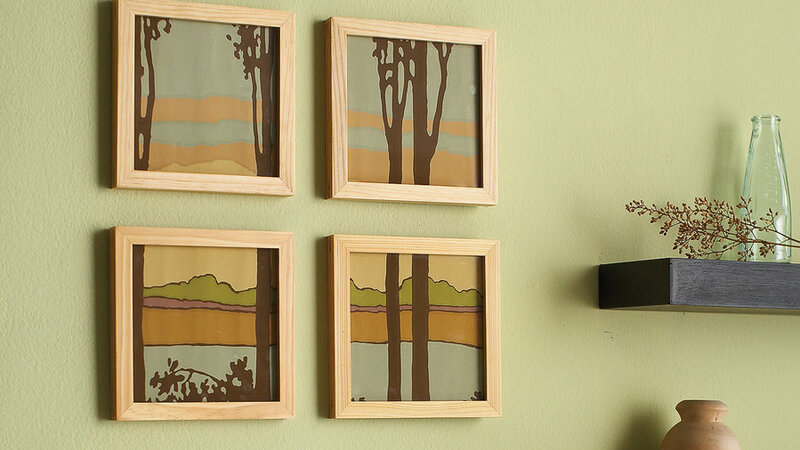 Recycle wallpaper samples or remnants by turning them into a striking room accent. Choose four simple frames of the same size and cut your remnant or sample to fit. Frame each piece as you would a photograph and mount on the wall, using a ruler to ensure even spacing between each. You can also frame four different patterns in complementary colors; experiment to find the best arrangement. Add a dose of whimsy to a contemporary setting with a charmingly casual wall panel. Set votives or small decorative objects on an artful display shelf. Resources: Wallpaper From Bradbury & Bradbury Art Wallpapers ($3 for 12- by 15-in. sample, or $42 per yard; 707/746-1900). Wall panel From Design Public (800/506-6541). Wall shelving Branch wall shelf in chocolate by West Elm ($99; 866/937-8356).